No dupe event! Blighted: +500% Power, and heal 30% when hit. Wardens: +500% Health, and revert 30% of damage received to enemy Blighted. "revert 30% of damage received"... Crazy, just crazy. My poor blighted heroes... you lose even when you win. Yeah, I'm thinking Wardens are the way to go this time. Much better survivability, and way too good against blighted. Blighted are wrecking non warden teams though. 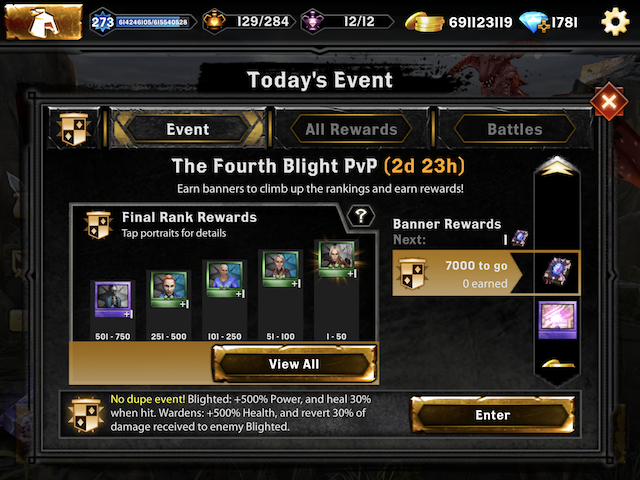 I noticed it too late... my blighted team was defeated by a huge retaliation which I didn't understand until I noticed it. I've told Urthemiel to hold back but the fool just blasts away and down they go, one at a time, the old one, the kid, the ancient, Archie and finally the archdemon himself. Defeated .